Spectrum Filtration Pvt. Ltd. now introduces solutions to problems in the area of odor control, VOC abatement and other gaseous removal. The Spectra Gas Phase / Chemical / IAQ is available in a wide range of standard filter sizes; they can be directly installed in an existing "Universal Holding Frame" filter bank. No expensive system modification is required to install these filters. When used in conjunction with "Spectra Pre" or "Spectra Fine" particulate removal filters, they ensure economical & effective removal of particulates, odors & gases. Spectra Gas Phase / Chemical / IAQ filters are used to effectively remove odor associated with diesel fumes, hydrocarbons, tobacco smoke, body odors, cooking and Volatile organic compounds (VOC). 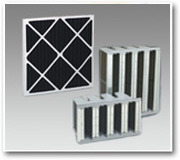 Spectra Gas Phase IAQ filters are a versatile, high efficiency combination filter (particle and molecular) used to effectively remove odor associated with diesel fumes, hydrocarbons, tobacco smoke, body odors, cooking and Volatile organic compounds (VOC) in public and commercial buildings. It designed three types according to customer requirement as follows.